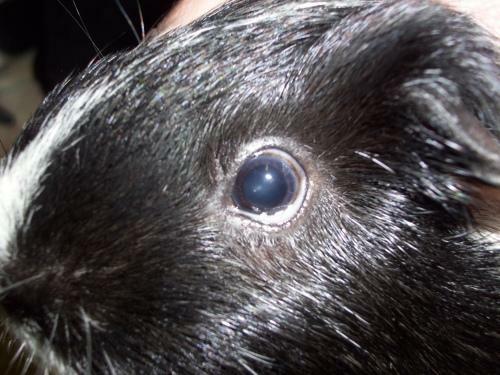 My 4 year old female guinea pig has had slight fatty eye for a few years. However, this past week it looks like a piece of the conjunctiva has protruded up and outside of the eye. It doesnt seem to bother her at all, she doesnt even notice it. Then just a bit ago I checked her, and her eye was all bloody. I wiped it off gently and it looked like a blood clot or piece of skin came off. It looked like something that was full of blood popped. 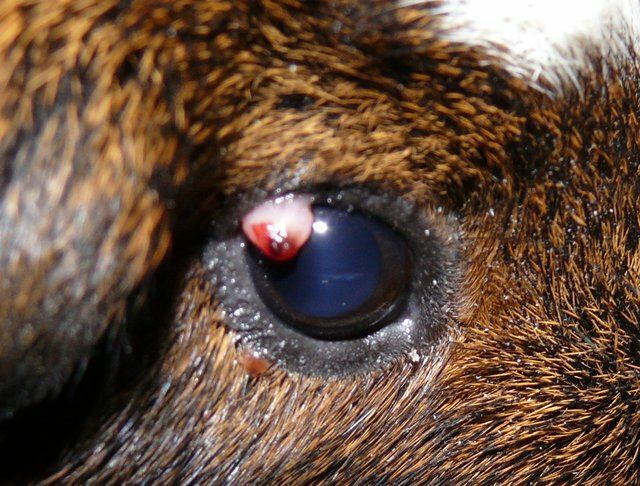 The bleeding stopped immediately , and now she is back to the fatty eye, including the piece of skin coming up and over her lower eyelid. She is getting a vet appointment right away in the morning. The end of the piece of skin is red because it just stopped bleeding. Otherwise, it is pink like the rest of the conjunctiva. Her eyes are not cloudy, thats just from my cheap camera. Ruthie is not overweight, and has a very healthy diet and lifestyle. Ive seen fatty eye (or, pea eye) before, but never where a piece of skin is protruding out from the lower eyelid and hanging out. Ouchie. I think someone else had this issue. Let me see if I can find the thread. I hope Ruthie's vet visit goes well. It does look like it might get irritated and perhaps surgery could help. Your pic is great. Let me know if I can add it to the board. Yes go ahead and add Ruthie's picture! I just made an appointment for her and we are off to the vet right now. She will be seeing an exotics vet so she'll get good care. This morning that flap of skin is no longer there. So I dont know if she pulled it off or something overnight. But I'm printing the photo that I posted, and bringing it with me to the vet. Thank you for the links, Tracis. Ruthie's eye looks like the picture in "Belles eye" -- only Ruthie's pink hanging-out thing had ruptured and filling her eye with blood. Hello - where was Ruthie's picture moved to? I cant find "the board"
Update: The vet just called and said that she put some local anesthesia on Ruthie's conjunctiva, and snipped off that part of the eye that was hanging out (ewww!). She is sending her home with some sort of eye drops. ... and some Baytril just to ward off infection since it was an open wound. I have not picked up Ruthie yet (not until after work). Hope all goes well with Ruthie and her recovery. Sending good thoughts for Ruthie, and I hope she has a speedy recovery. Did your vet mention what this condition is called? rcrolivia, by asking if I could add it to the board, I asked if I could copy the pic and upload it here so it will always be available, even if whoever is hosting the current pic goes out of business. That way when someone brings up your thread, they are ensured they can see the pic. What I do is edit your thread and replace the link you gave with the permanent link here. Hope this explains it. I hope it goes well too!! Eyes often heal well. Just use the drops/cream religiously and call the vet if you see any signs of infection. The vet gave her a local anesthetic on her eye and snipped off that part of the conjunctiva that was hanging out. She said it was necro-something (dead skin), so she trimmed it off. The vet did not mention the name of this condition, and she said she didnt know what it was. Sent me home with Gentamicin Ophthamalgic Solution to put in her eye once a day. We will see how it goes.... otherwise, Ruthie is doing great and eating her green leaf lettuce right now. Go Ruthie! Glad you're doing so well. The eye looks great! I can add this pic too. Sorry to bump in on an old thread, but I just wanted to add my experience. 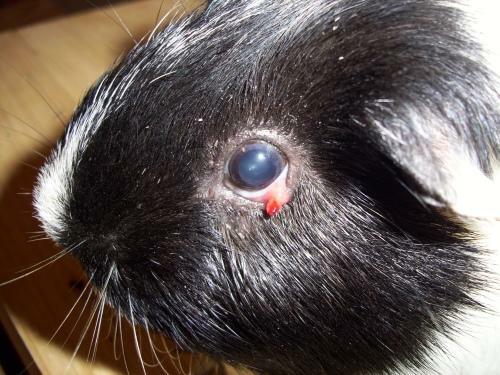 I had a guinea pig with the exact same symptoms and it went away in a couple of days with a steroid and AB eye drop. Very unusual, smo. Would you like me to add your pic to this thread? What kind of antibiotic drop did your pig get? Was the steroid injected? Just basic steroid + AB drop. I believe it was Oftan Dexa - dexamethasone and bentsalconium chloride (paraphrasing, I'm not sure what the english names are). The extrusion visible on the photo went totally away in something like 4 days after administering the eye drops. Also nothing was injected, just drops. Thanks for the pic. I was surprised how prominent it was and that it went away fairly quickly after giving eye drops.